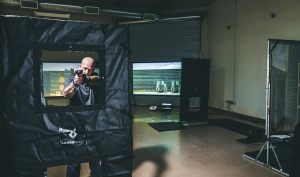 Transform an indoor space into a cutting-edge, modular competition shooting course! 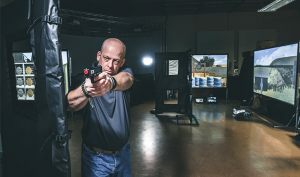 Run & Gun is a perfect addition to any shooting sports complex, gun store, training academy, entertainment venue, or event and can be configured into countless virtual courses by rearranging premade stages or with optional add-on packs in the future. 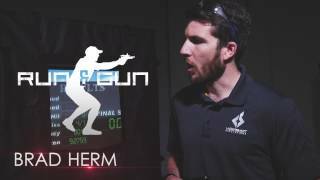 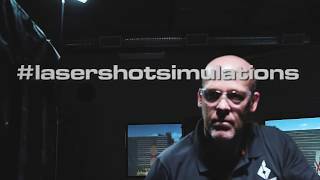 The next evolution of Laser Shot’s hit software title Practical Shooting - Run & Gun takes it to the next level by networking multiple shooting lanes into a single, action-packed simulator that emulates real IPSC- or IDPA-style competitions without the need for live firearms. 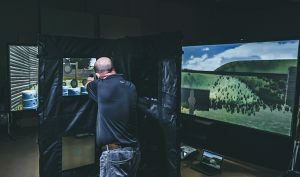 When paired with Thermal Shot™ Live-Fire Technology, Run & Gun is ideal for indoor live-fire ranges who want to modernize their customers’ experience and increase attendance. 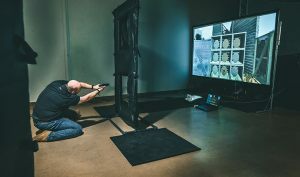 Compatible simulation firearms include inert laser trainers, drop-in recoil kits for real firearms, UTM kits, or dedicated recoil non-gun training weapons. 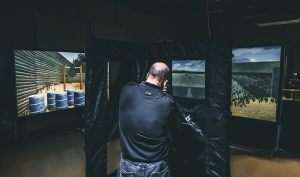 Add a few CCAT modular barriers to the indoor course to create a truly 3D competition shooting experience.